Offering free Wi-Fi and rooms with microwaves and mini-fridges the Days Inn Tunica Resorts is one of the area's most popular hotels among our guests. The two-story Days Inn offers 66 rooms with microwaves mini-fridges and coffeemakers so you always have access to a cold drink and a hot cup of Joe. Rooms are also equipped with alarm clocks hairdryers irons and ironing boards. Check your email or update your status from your room with free Wi-Fi. Computer access is available in the business center. Pets are welcome. Parking is free. Non-smoking rooms are available. 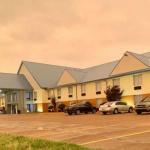 The hotel is located off Highway 61 within five minutes of at least five different casinos. Hungry guests will find a few dining options within walking distance and even more options within 10 minutes of the hotel. Tunica National Golf and Tennis is less than a mile from the hotel and Links Cottonwood is four miles away. The hotel is seven miles from Tunica Arena and Expo Center. Memphis area attractions including Graceland and Beale Street are approximately 40 minutes away. The hotel is 31 miles from Memphis International Airport.